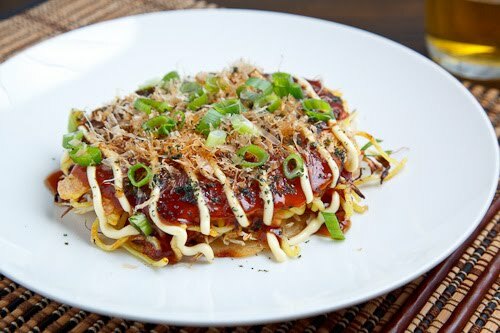 Okonomiyaki is Japanese comfort food also known as the Japanese pancake or the Japanese pizza where the base is made with vegetables and it is commonly topped with a sweet Worcestershire like sauce along with mayonnaise. This is the Hiroshima version of the okonomiyaki is made in a layered fashion. One of my favourite Japanese dishes has to be Okonomiyaki a savoury Japanese style pancake and luckily it is really easy to make at home so I can indulge whenever I want. 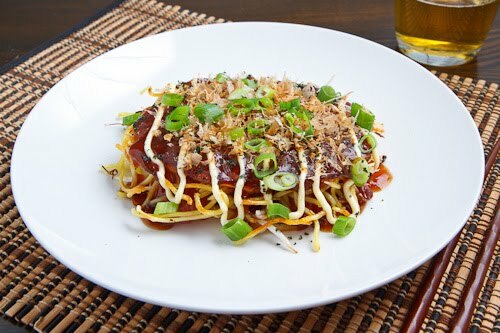 Recipes for okonomiyaki vary from region to region in Japan and there are two main styles of okonimiyaki the Osaka style where all of the ingredients are mixed up into a batter and cooked and the Hiroshima style where the ingredients are layered as the pancake cooks. I normally make the Osaka style of okonomiyaki as it is by far the easier recipe but the Hiroshima style okonomiyaki is also really good and definitely worth the effort to make it every once in a while. 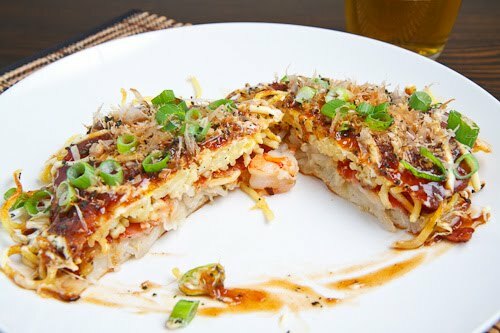 The Hiroshima style okonomiyaki starts out with a layer of the batter being poured onto the pan that is topped with a pile of shredded cabbage and bean sprouts and then some shrimp and bacon. The pancake is cooked until the batter in golden brown and then it is flipped and cooked until the bacon is nice and crispy. At this point some noodles are fried in a separate area and then topped with the rest of the okonomiyaki. Finally an egg is fried and the whole okonomiyaki is placed on top of it with the noodle side down. The okonomiyaki is then served with the egg side up and topped as you like. The name okonomiyaki is derived from the word that means “what you like” or “what you want” so really this recipe is just the basis and you can change things up to make it the way you want. I like the cabbage and beasprout mixture for the base but I also like to play around and I often find myself adding things like grated zucchini, sweet potatoes or even pumpkin. I also like to add some seafood and shrimp is probably what I use most often but octopus, crab and scallops work just as well. For the toppings, I like to go with the usual okonomiyaki sauce, like a sweeter Worcestershire sauce, mayonnaise, katsuobushi, green onions and aonori. Mix the flour and dashi until smooth. Heat the oil in a pan over medium-low heat. Pour 1/4 cup of the batter into the pan in the shape of a circle about 6 inches across and let it cook for a minute. Place half of the cabbage on top followed by half of the sprouts, shrimp and bacon and finally drizzle some more of the batter on top to hold everything together. Cook until the bottom is golden brown, about 6-10 minutes, flip and cook until the bacon is crisp, about 6-10 minutes. Meanwhile heat half of the noodles in another pan and form them int a circle about the same size as the okonomiyaki. Transfer the okonomiyaki on top of the noodles and press down firmly. Fry an egg in the other pan, breaking the yolk and when it is just about set, transfer the okonomiyaki on top and press down firmly. Repeat for a second okonomiyaki. Serve the okonomiyaki egg side up topped with okonomiyaki sauce, mayonnaise, katsuobushi (bonito shavings), green onions and aonori (dried seaweed powder). Looks great, Kevin! This was one of my favourite meals while travelling in Japan and it looks like you nailed the recipe. Yum! Often "a little more effort" yields a lot more taste! This does look welcoming and I love the easy substitutions/additions. I really like your idea of using the yakisoba noodles!! When I lived in Japan, I remember making this with regular old soba noodles!! I love okonomiyaki, I've only made the Osaka style. This one does look good, it's a must try for sure! That looks amazing. I would love to learn how to cook Japanese food AND make it look as good as you do. 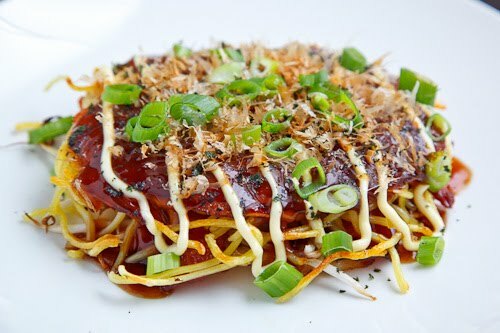 Mmmhhh, this okonomiyaki just looks mindblowing and so droolworthy! Looking lush Kevin… can you send me one Down Under?????? I've never seen anything like this, and I just love it! Can't wait to make it myself! Thank you for sharing this recipe! Just saved the recipe and it will be made soon. I know my daughter will love this! I had never heard of Japanese pancakes before. Wow, this is my favorite dish in Japanese restaurants and for some reason it never occurred to me that I can make it at home! Thanks for the recipe!!! I am SO lucky ! I am going to send this to her and see if she will make it for us when they visit. This looks absolutely delicious. I had just read about this particular dish the day before yesterday, so it was a surprise to see it on your page when going through my RSS feeds! I originally came to your website because of the amazing pumpkin recipes you had, but I ended up staying for all of the delicious food you seem to conjure up. I've loved every single thing I've made so far. Amazing. I am so looking forward to making this. I love Okonomiyaki!!! So happy to have found your recipe, and can't wait to try it! I've spent time in Japan, and this was one of many favorite dishes that I fell in love with… so happy that you posted this, thank you!